The Second Generation of North Kiteboardings Hugely popular light wind freeride kite! The Juice is ideal for those days on the beach when the wind doesn’t arrive. The Juice comes in two Sizes, 15 meters and 18 meters and is designed around a 3 strut platform. This is to assure it retains its playful nature in spite of its big size. The Juice has amazing upwind performance, even in hardly any wind. Unlike some large kites, which have a racing focus in mind, the Juice was designed for freeriding. 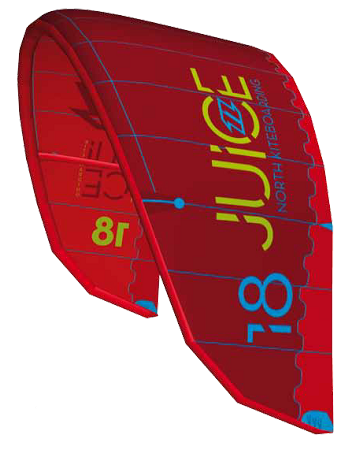 During the design process the juice was testing using twin tips, this enabled North to ensure the kite offers the optimum performance for light wind freeride action. You’ll be amazed with the huge jumps on the juice too. 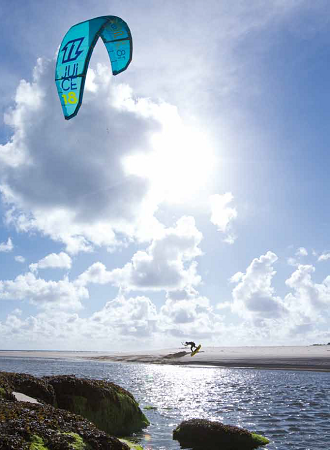 The kite glides and offers plenty of hang time and is a great option for airstyle tricks. Don’t get stuck on the beach, grab a refreshing Juice and get on the water!